In the summer of 1983, I flew to California for a few weeks of muscle pumping at the new Gold’s Gym and original World Gym in Venice. For years, I had read about the champions in the physique publications and had met a few throughout my bodybuilding career but never had the opportunity to train with them. While in Venice that all changed. I was training twice a day. Between workouts, I tanned at the beach with other male and female muscle builders that shared my same passion. I was in muscle heaven and living the bodybuilding lifestyle alongside the champions. Every morning I arrived at World Gym at 7 AM. Already training at that early hour were Arnold Schwarzenegger, Franco Columbu, Frank Zane, and a host of other well-known bodybuilding legends. It was a great environment to train in and I gave it my all to make the most of my time there. I had the pleasure to workout with Arnold. 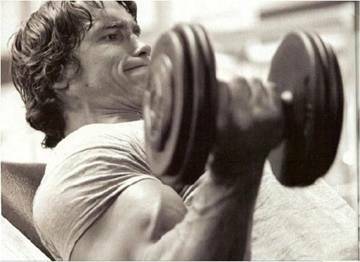 One thing about Arnold that stood out was his ability to focus intensely on each and every exercise he performed. Watching him train you could see the fullness of his muscular structure change as he pulled and pushed the steel with perfect form. When I trained with Arnold, I performed the same exercises and techniques. We both trained with moderate weights and rested little between sets. Every single repetition we pained through was performed using a full range of motion and unique style. It was a great experience for me to workout with the Austrian Oak. I not only learned how the Muscle Beach bodybuilders trained but also witnessed my physique respond well to Schwarzenegger’s bomb and blitz routines. Arnold liked to joke between sets. He’d banter with Franco across the gym just to get him going. Franco also had a great sense of humor and would always swipe back at Schwarzenegger, sending the gym’s members into an uproar. Bodybuilding to Arnold seemed like a celebration of life! He always looked happy while he trained and seemed fulfilled with his efforts. For me, training with the Austrian Oak proved to be a once in a lifetime experience. Not only for the workouts we shared together, but also because of the positive attitude he exuded throughout the gym. In contrast to World Gym, Gold’s Gym was huge and filled an entire warehouse size building with every piece of exercise equipment imaginable within its walls. While training at Gold’s Gym in the evenings, I had the opportunity to workout with many well-known physique champions of the era. 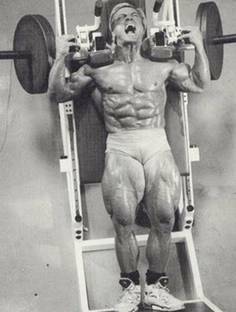 One evening I had the pleasure of bombing my thighs with bodybuilding champion Tom Platz (see photo). Tom was an extremely intense bodybuilder to train with. One exercise I remember was the Hack Squat. Together we worked up to several hundred pounds in the exercise and what was truly amazing was not the heavy weight used by Platz but the way he performed the movement. While performing Hack Squats, he would put both feet close together with toes pointed out and placed near the bottom of the Hack machine’s footboard. From the top starting position, he would crash down in an exaggerated motion while stretching his quads forward for maximum stimulation. From there I would slightly assist him back to the top where he would immediately repeat the same crashing motion. How his knees didn’t explode, I don’t know. Nevertheless, this is the manner in which Platz performed all of his thigh exercises – with lots of explosive force and extreme intensity. I can still remember the pain I felt in my thighs in the following days. I also remember how great it felt to be in California during that era when bodybuilding was still a close-knit community. So much has changed! It came as no surprise to the bodybuilding community that Arnold achieved his lofty goals. Arnold is a conqueror! After he dominated the bodybuilding and film industries, he set his deep grey Austrian eyes on his long time political aspirations. For years, we all talked about him becoming the governor of California and when the opportunity arrived, he threw his hat into the political ring to win the job. In a way Arnold is much like that of the character Conan that he portrayed on the silver screen. He knows deep in his heart that his is a life that will lead many. He has a purpose for being here. He must never rest until all his goals are realized. The only thing stopping Arnold from becoming a future U. S. president are the words within our Constitution that state one must be born in this country to serve as Commander-in-Chief. Too bad, I believe Arnold would really try hard to be a good leader of the free world.